View basket “Blue Rocking Horse Birth Sampler” has been added to your basket. A White New Arrival card on white aida with charms. 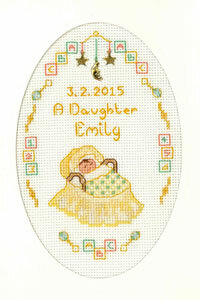 This oval card has a border with letters and numbers, and rattles created from a cluster of pearly beads. A mobile of three brass charms are suspended above a baby cradled in a traditional bassinet. The wording has the date of birth, ‘a son’, or ‘a daughter’, and the name of the child. 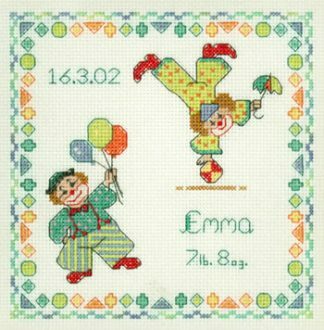 This White New Arrival card cross stitch kit pack has everything to create a new Birth greeting card to welcome a new baby. The pack has top quality materials; Zweigart fabric, DMC thread, Mill Hill charms, beads, needles, card and envelope. The kit has full instructions and a clear colour chart. This New Arrival card design is part of the Decorative Textiles collection. 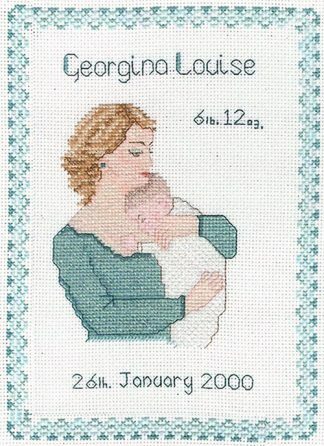 The range has a wide choice of birth cross stitch cards and samplers.